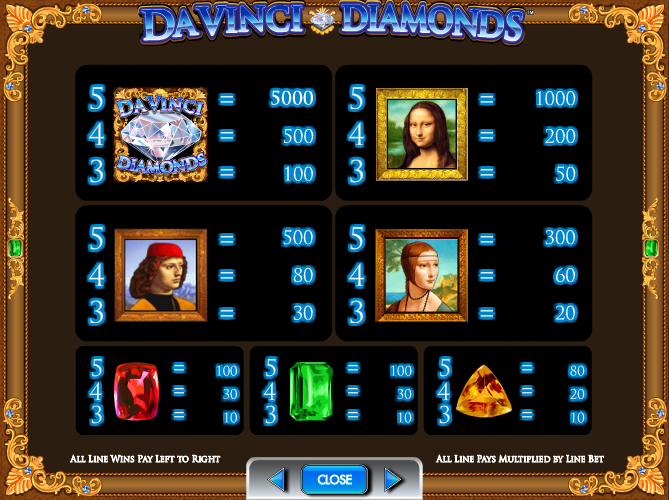 No one ever really complains that there isn’t enough culture or high art running through online slot machine themes but it can only be a good thing when a game like Da Vinci Diamonds pops up. It features a range of Leonardo Di Vinci’s portraits as well as one of our favourite features – the cascading reels. This is a five reel and twenty payline machine from IGT and the reels are set in an extremely ornate frame to complement the subject matter. Orange, green and red gems represent the lower value symbols but the portraits of the Mona Lisa, Cecilia Gallerani and ‘Portrait of a Young Man’ and a Da Vinci Diamonds logo are worth considerably more. The Bonus symbol acts as the scatter and a big Wild represents the wild symbol. This is the cascading reels to which we referred earlier and it occurs in standard and bonus gameplay. Every time you spin a win, those symbols involved will disappear to allow more symbols to fall from the top and fill the gaps – these can now create new winning paylines. This is where the big money gets won and you’ll need to land three of the bonus symbols on reels one, two and three to trigger it. There is no extra multiplier during this phase but the tumbling reels feature is still in play so you seem to get plenty of extra spins. It’s also important to note that the symbols change in the bonus round so as well as an opal plus yellow, blue and purple gems there are another three portraits – Portrait of an Unknown Woman, Madonna of the Yarnwinder and Virgin of the Rocks. You can win more spins while in the bonus round by landing more bonus symbols up to a maximum of 300. Check the video below for the bonus game and tumbling reels feature. 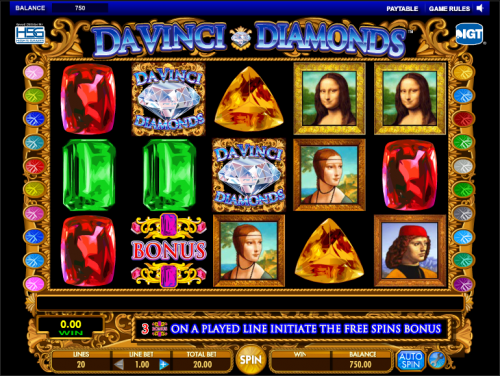 The various Da Vinci portraits make this a game worth experimenting with just for the novelty value; add to that the great tumbling reels feature and the bonus game and this is an addictive slot.